Today on ESPN.com, there's a big article on hot-hand research. The article is written primarily through the lens of Klay Thompson and his deep-launching Golden State Warriors teammates, but also discusses the 2015 research of Joshua Miller and Adam Sanjurjo, claiming a "substantial" hot-hand effect in the NBA All-Star three-point shooting contest. In addition, Tom Gilovich, lead author on the 1985 study claiming no support for a hot hand, shares his thoughts in the ESPN article on how the Miller-Sanjurjo research may (or may not) have revolutionized how we should think about hot-hand effects. Gilovich, a longtime Cornell University psychology professor, notes that he has shared the Miller-Sanjurjo research with some Cornell mathematicians and that, "People with tremendous math skills are all over the map on this one." My own take on the Miller-Sanjurjo research, from back in 2015, is available here. Be sure to see Miller's comments on my piece and my reply. One side note on today's ESPN.com article is that, where author Tom Haberstroh alludes to the fact that, "The legendary Bobby Knight wasn't a fan of the so-called fallacy [claimed by Gilovich and colleagues], either," the embedded hyperlink leads to my book! As virtually all readers of this blog would know, the UConn women's basketball team had its latest gargantuan winning streak, one that had reached 111 games, snapped in the Final Four national semifinals by Mississippi State. Shortly afterward, I tweeted a graphic I created to show how Mississippi State milked the shot-clock to shorten the game against UConn. Back in April, Guy Molyneux wrote in to Andrew Gelman's blog, arguing that, "the hot hand likely has a negligible impact on game outcomes." In the comments section below Molyneux's piece, Miller and several other discussants debate the argument. The University of Connecticut women's basketball team goes for its 100th straight win tonight, hosting South Carolina in a nonconference match-up. The 100-game mark seems mainly about symbolism, as the Huskies have already had a 90-game winning streak (snapped in 2010) and a 70-game victory stretch (ended in 2003). The John Wooden-coached UCLA men's basketball program pulled off an 88-game winning streak, which ended in 1974. 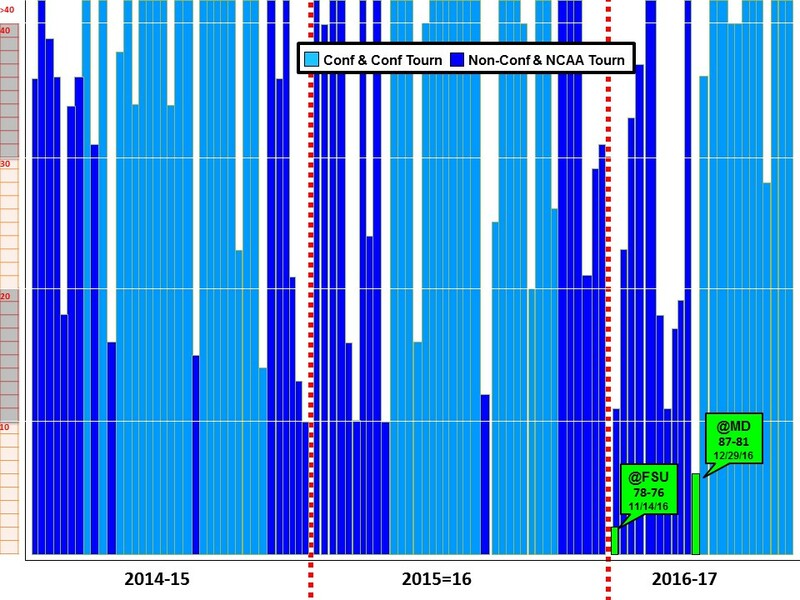 The following chart shows UConn's margin of victory in its last 99 games (arranged chronologically from left to right). Exact margins are shown up to 40 points, but if the Huskies won by more than 40, there's just a ">40" box on top. You can click on the graphic to enlarge it. UConn used to be in the Big East, along with, at various times, such top women's hoop programs as Villanova, Notre Dame, and Louisville. However, after the big conference-realignment shake-out of the 2010s, the Huskies ended up in the American Athletic Conference (AAC), which at the moment doesn't have any real competitors for UConn. 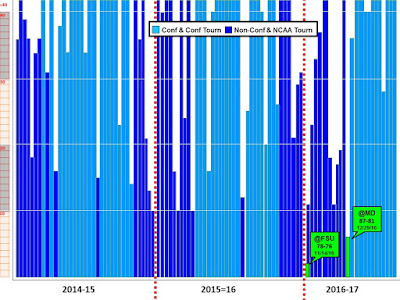 The royal-blue columns represent nonconference games (both in the regular season and in the NCAA tournament). To UConn's credit, it schedules many games against elite nonconference opposition, including Tennessee (until 2007), Notre Dame, Duke, Baylor, Maryland, Florida State, and tonight's opponent, South Carolina (curently ranked No. 6 in the nation). As can be seen, the heights of the royal-blue bars are much lower than the light-blue ones. In fact, twice this season UConn won by two and six points, against Florida State and Maryland, respectively. I would think UConn would be a heavy favorite tonight, but if there's any chance for the game to be competitive, having a strong nonconference opponent makes it more likely. *The information on the UCLA men's streak was added later. Tonight, in the nation's capital, the Columbus Blue Jackets will try to tie the NHL record of 17 straight wins, held by the 1992-93 Pittsburgh Penguins. Here's a chronicle of how the team's 16 wins have unfolded. Many articles have appeared on the Blue Jackets' streak, from analytic (here, here, and here), and even Bayesian statistical perspectives. I was interviewed in this SB Nation article. Two main issues stand out to me. One, which the SB Nation writer discussed with me but didn't make it into the article, is the likelihood of a team with the Blue Jackets', shall we say, non-illustrious history going on such a long winning streak. 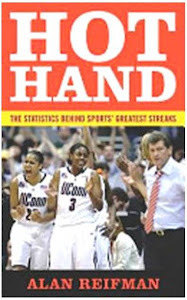 As I wrote in my book Hot Hand, "many of the most famous streaks... have been compiled by athletes and teams who are among the all-time greats in their respective sports" (p. 5). Examples cited include Kobe Bryant, Joe DiMaggio, and Tiger Woods. As the late Harvard paleontologist Stephen Jay Gould once wrote, "Long streaks always are, and must be, a matter of extraordinary luck imposed upon great skill." The second issue, pertaining to on-the-rink statistics, involves shots on goal. Because goals are rare in hockey, analysts typically focus instead on teams' shot-on-goal totals, which turn out to be a good measure of puck possession (see the new book Stat Shot: The Ultimate Guide to Hockey Analytics, by Rob Vollman and colleagues, for further discussion). As shown here, in games before the streak, Columbus and its opponents were each taking roughly 50% of the shots (see the columns marked Corsi, Fenwick, and Shots For). During the streak, in contrast, the Blue Jackets have around 54% of the shots in their games and their opponents, 46%. Aggregate shot totals can be misleading, however, because of score effects, the phenomenon of a trailing team bombarding the opposing net with desperation shots in an attempt to get back in the game. I created the following graphic to take game context into account. 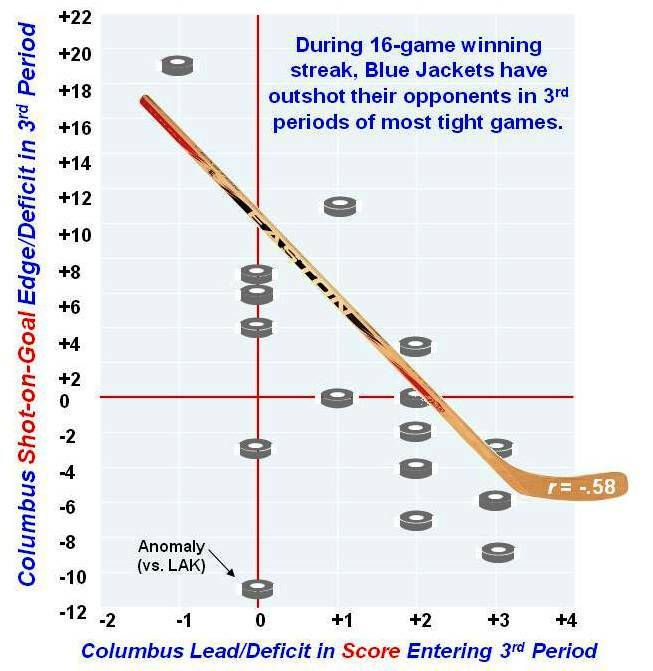 Using a puck image for each game during the Columbus winning streak, I plotted the Blue Jackets' deficit or lead on the scoreboard on the x-axis (from losing by 2 to winning by 4). On the y-axis, we see differences between the Blue Jackets' and opponents' actual numbers of third-period shots (which may be more intuitive to grasp than the percentage of total shots attributable to each team). The puck in the upper-left corner of the graph, for example, represents the Blue Jackets' December 3 game at Arizona, the third game in Columbus's streak. The Jackets trailed 2-1 after two periods (the only game during the streak in which they entered the third period trailing), but in a feverish attempt to tie the game (which Columbus did with 2:16 remaining), outshot the Coyotes 23-4 in the third (+19). Columbus eventually won 3-2 via shootout. If a game is close (i.e., tied or within one goal either way) heading into the third period, we should find Columbus dominating the shots-on-goal totals in the third period during the winning streak. If the Blue Jackets are relatively comfortably ahead, on the other hand, we would expect their opponents to be dominating the shots. This is exactly what we find. For those with some statistical training, the correlation between size of Columbus's lead on the scoreboard (with a deficit scored with a negative sign) and their edge or deficit in third-period shots was a statistically significant (r = -.58; see blade of the hockey stick in the graphic). The less favorable the Blue Jackets' situation after two periods (trailing or tied), the more they outshot their opponents. So, if you're a Blue Jackets fan or simply like to see long streaks, don't worry if Columbus is not leading after the second period. In that event, a Blue Jacket barrage on the Capitals' net seems almost certain! UPDATE: It was not to be for the Blue Jackets, as the Washington Capitals routed them 5-0, ending Columbus's winning streak at 16 games. *That's not to say that amazing turnarounds don't occur. Baseball's Atlanta Braves went from a 65-97 record in 1990 to 14 straight divisional titles (excluding the incomplete, strike-shortened 1994 season). Also, football's San Francisco 49ers went 2-14 and 6-10 under Bill Walsh in 1979 and 1980, respectively, before winning the Super Bowl after the 1981 season. The team would win three more Super Bowls in the decade.